uKloo was developed as a reading game with the help of teachers, parents, lids, and special needs family testers. Great for kinesthetic learners. Offers physical exercise, builds confidence, and promotes independent learning and play. Kids search for clues and learn to read in this interactive literacy game. The QuickSmart Scramble Bug has four quiet wheels that move 360 degrees. Four cute characters. Folds flat to store & travel; Teaches to push and steer; Ideal inside or outside; Quiet, non-scratch wheels; Ready to roll - no assembly. Kids can send marbles down the wooden 99-piece Quadrilla Twist & Rail Set. Curved rails, straight rails, and a big twist make up this set. 50 marbles are included along with a cloth bag for safe storage. FyrFlyz is a revolutionary new spinning toy that puts the power to create an amazing light show in kids’ very own hands. Each FyrFlyz toy is a precision balanced instrument designed to spin on its axis. Simply by swinging the connected two strings and applying tension or allowing slack, kids create a continuous movement (figure eights, rings, etc.). The fun begins when the lights go out and the FyrFlyz multi-color LED lights turn the movement into an amazing light show that kids can play themselves or show their friends. lapiluv is the only wearable attachable activity center for parents to play with their children, mixing technology and traditional toys. Launch date: September 2011. Standing over two feet tall, the Weird & Wacky Contraption Lab has 60 mix-and-match pieces to build an unlimited amount of contraptions. Kids can dream up crazy courses, then build and test them using this easy-to-construct Velcro-like system. Instructions offer tips and tricks on how to best manipulate the kit's components. It guides kids through five sample contraption designs while they learn how to predict the outcome of each. "Contraption Lab offers full-circle skill building from prediction and planning to testing and experimentation," Nancy Storment, marketing & PR rep for SmartLab Toys, told TDmonthly. Launch date: October 2011. Awards: TDmonthly Top Toy Award, January 2012. — Why it won: A great product that encourages creativity. This adorable soft-bodied baby doll comes complete with its own feeding bottle and soft bunny. Thanks to the mini picture book that is also included, little girls can learn how to take care of Bebe Do Mode just like a real mommy. Dressed in a bright new outfit for the new year, this classic 14" Corolle doll will be treasured for years to come. Launch date: January 2004. ― In a May 2012 survey about dolls, 5 out of 11 retailers said Corolle was their best selling brand. The first Corolle doll ever made, Bebe Cheri is relaunched every year with a new outfit to celebrate. At 20 inches tall, Bebe Cheri is sized like a real 3 month old baby. This year (2011), she comes dressed in an adorably bright flowered jumper. She can even wear real baby clothes (size 3 months), making her a treasured heirloom to be passed down for generations. Launch date: 1980. PINKALICIOUS & SILVERLICIOUS* (NY Times Bestselling Children's Book List), PURPLICIOUS, AND GOLDILICIOUS Hardcover books by Victoria Kann & Elizabeth Kann - COMPLETE SERIES. Sixteen 27" square 100% nylon scarves, two of each in the following colors: cotton candy pink, dazzling pink, sunset sky-blue pink, perky purple, starbright gold, white frosting, silver, and lively lavender; An IDEAS Music CD with lots of dancing, twirling, magically inspired music selections; Instructional/informational inserts. Easy to store in our reusable sturdy storage bag with self-closing handles.Launch date: May 2011. Awards: Silverlicious - 2011 Creative Child's Book of the Year and Media of the Year Award. The Starry Night would have been just another landscape if it were not for van Gogh’s swirling layered brush strokes that make the painting come alive. 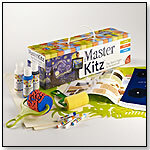 The Starry Night Master Kitz includes all the tools your child needs to create their own Starry Night masterpiece and learning materials to deepen their understanding of the original painting. Each Starry Night Master Kitz includes:A sturdy, re-usable art tool box with magnetic closures, 3 Custom Acrylic Paints (child friendly), 5 Custom Oil Pastels (child friendly), 1 van Gogh Roller specially designed to , replicate van Gogh’s active stroke, 1 re-usable Starry Night Cyprus Stencil, 1 standard paint roller, 2 pieces deluxe art paper, 1 low tack “Mesmerizing Stars” sticker sheet, Fun, easy-to-understand van Gogh learning materials, Easy-to-follow step-by-step instructions. The Tree of Life by Gustav Klimt and Water Lilies by Claude Monet kits are also available. Fifteen percent of Kidzaw’s profits are donated to programs that fund art for disadvantaged public schools in urban areas. — Why it won: This fun kit introduces kids to one of the most famous pieces of art in the world. Including educational materials about van Gogh, the kit also provides paint, stickers, and the tools necessary for kids to recreate, or re-imagine, the Starry Night painting. Viewing products 331—340 out of 1181 products.